As lawyers mobilize at airports across the country to support travellers affected by the U.S. travel ban, the federal government is trying to determine if enforcing the controversial executive order on Canadian soil is even legal. As Canadian lawyers mobilize at airports across the country to support travellers affected by President Donald Trump's U.S. travel ban, the federal government is trying to determine if enforcing the controversial executive order on Canadian soil is even legal. 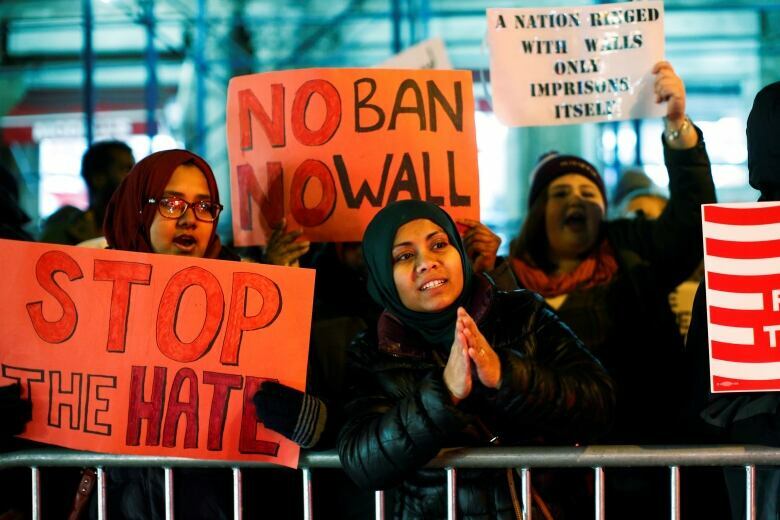 The ban, which came into effect last night after a temporary ruling from the U.S. Supreme Court, prohibits certain travellers from six Muslim-majority countries from entering the U.S.
"This is a ban on Muslims. It's discriminatory to its core," Corey Shefman, a lawyer and spokesperson for the Canadian Cross-Border Legal Coalition, said in an interview. But the chaos seen after the initial travel ban went into effect in February was not evident Friday, Shefman said, as airlines and airports seem clearer on the rules. Shefman warned that despite smoother travel, there may still be confusion over who is affected by the ban. "If you have a valid visa, you should get in fine. If you have a Canadian passport, you should get in fine," Shefman said. But the word "should" might be open to interpretation. He advised people who are pulled aside for questioning in the pre-clearance area to "be careful." They can ask to leave at that point, he said, and should seek out the advice of one of the 400 volunteer lawyers at airports in Toronto, Vancouver and Winnipeg who are ready to help. Very grateful for the 9-O decision from the U. S. Supreme Court. We must keep America SAFE! "Part of the reason we're there is to make sure Muslim travellers, whether or not they're from the affected countries, are not caught up in this ban. This was a common theme last time, and we expect that it will be again," Shefman said. Trump brought in the ban through an executive order shortly after taking office in January. It took effect immediately and targeted travellers from Iraq, Syria, Iran, Libya, Somalia, Sudan and Yemen, countries the president considers dangerous. Iraq is not part of the revised version of the ban temporarily approved by the Supreme Court. The swift implementation of the ban led to widespread confusion at border crossings and airports in the U.S. and around the world as airlines and customs agents struggled with the new rules. "No one knew what the heck was going on," Shefman said. Protesters gathered in several Canadian cities, including Vancouver, Toronto and Ottawa, with worries about the ban affecting Canadian permanent residents and splitting up families — among broader human rights concerns. Lawyers with the Canadian Cross-Border Legal Coalition are helping travellers sort through the ban, but there is hope for more clarity this time around. "We hope that the airlines, the airports and U.S. officials have had time to figure out what went wrong last time and figure out how to make it better," Shefman said. Another aspect of the ban that Canadian lawyers and the federal government are watching closely is its potential violation of Canadian law. At major Canadian airports and other departure points, U.S. border agents process travellers in pre-clearance areas. Because the U.S. agents are working on Canadian soil, they are subject to Canadian law. Audrey Macklin, a law professor and director of the Centre for Criminology and Sociolegal Studies at the University of Toronto, said the ban that targets individuals based on national origin is "highly discriminatory." "It seems to me that even this partial ban would flagrantly violate the Canadian charter," Macklin said in an interview." Under the federal law that permits pre-clearance activities, Macklin said U.S. officials are protected, even if they are enforcing rules that violate Canadian law. "If there's any liability at all, it's liability of the Canadian government for knowingly permitting these charter violations on Canadian soil." 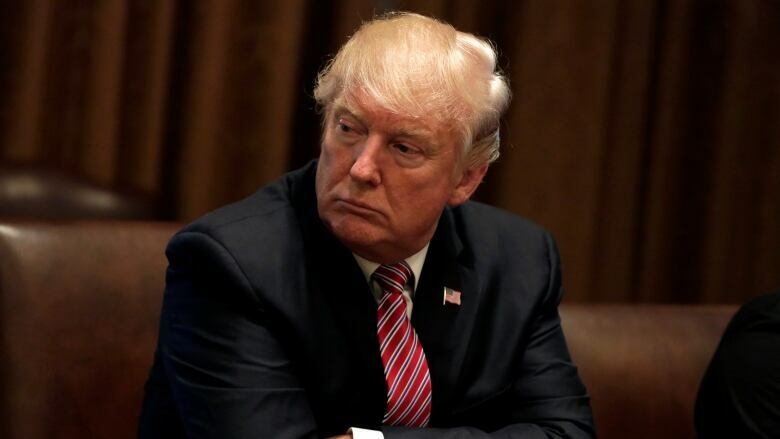 The federal government, which began to review the legality of the travel ban in February, is now looking at the revised version temporarily approved. "The details of the executive order have changed since February, so the government is again in the process of determining what, if any, impact the recent U.S. executive order has on current pre-clearance activities or on the agreement on land, rail, marine and air transport pre-clearance between the government of Canada and the government of the United States," Karine Martel, spokesperson for Public Safety Canada, said in a statement. "Any U.S. pre-clearance activities in Canada have to be carried out in a manner consistent with Canadian law, including the Canadian Charter of Rights and Freedoms, the Canadian Bill of Rights and the Canadian Human Rights Act," Martel said. This week's Supreme Court decision requires travellers from the affected countries to prove "a bona fide relationship with a person or entity in the United States." Although legal experts are predicting a "small number" of travellers going to the U.S. from Canada will be denied entry and that dual Canadian citizens will have nothing to worry about, Shefman isn't so sure. "A Canadian passport isn't a guarantee of anything," he said. 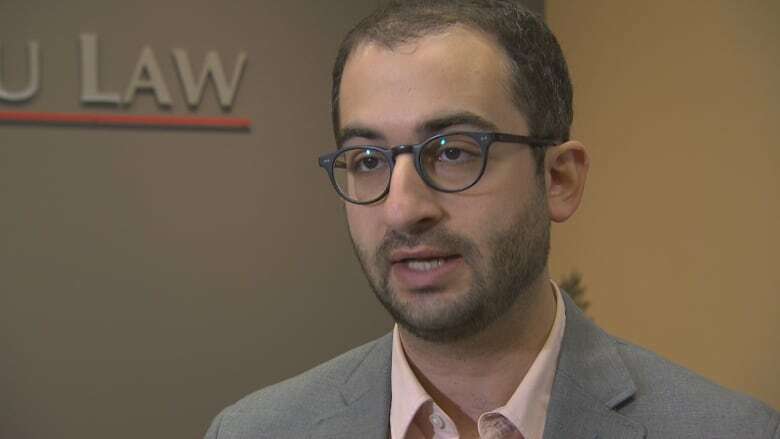 During the first implementation of the ban last winter, Shefman said, lawyers with the Canadian Cross-Border Legal Coalition dealt with travellers who should have been free to enter the U.S. but were targeted by agents only because they were Muslim. The legal coalition is prepared for this to happen again. "American customs officials at pre-clearance centres have really significant discretion about who gets in the country. And what this ban does is give them more discretion," Shefman said.